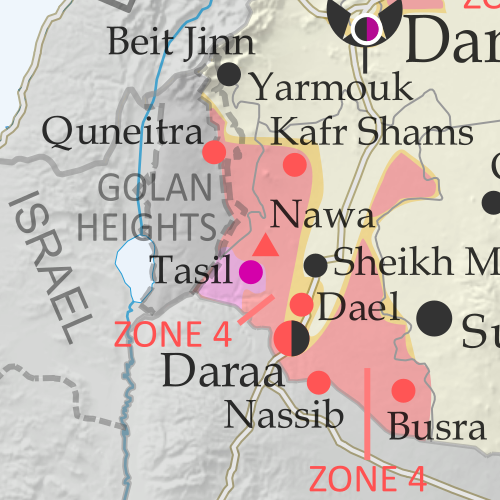 The past few weeks since our previous Syria map update have been dominated by news from two main arenas of battle, both in the country's northwest. In the most politically significant development, the Turkish military has entered the Kurdish-administrated Afrin region (also spelled "Efrin") as part of a mission, alongside allied rebel fighters, to drive Kurdish militias out of the western border region. 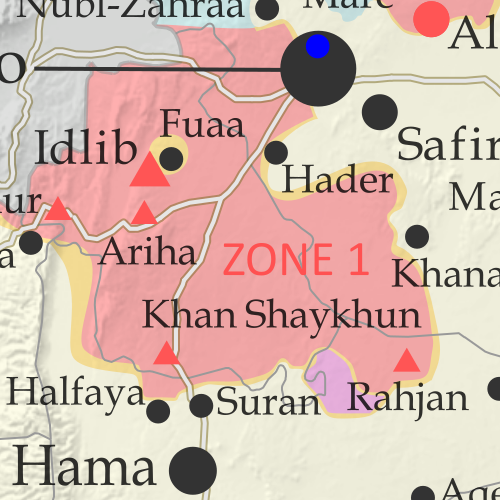 Meanwhile, forces loyal to Syria's Assad government have made major advances in areas south of Aleppo, eliminating an enclave of the so-called "Islamic State" (IS; formerly ISIS/ISIL) and cutting into rebel control around the edges of Idlib province. Basemap by Koen Adams of onestopmap.com, with territorial control by Evan Centanni and Djordje Djukic. All rights reserved. 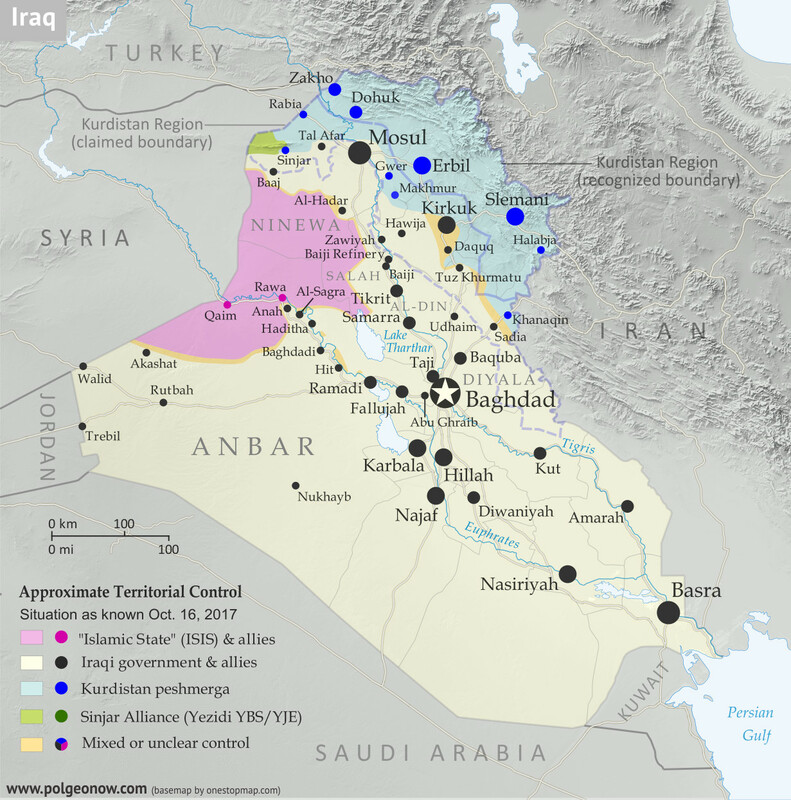 Since our previous Iraq control map update in late July, there have been big changes to territorial control in Iraq, all involving expansions of control for the Iraqi military and its close allies (mainly police and Iran-backed militias): The so-called "Islamic State" (IS; formerly ISIS/ISIL) has been driven out of its Tal Afar and Hawija enclaves, and the disputed city of Kirkuk has been retaken from Kurdish forces in response to the controversial Kurdistan independence referendum. 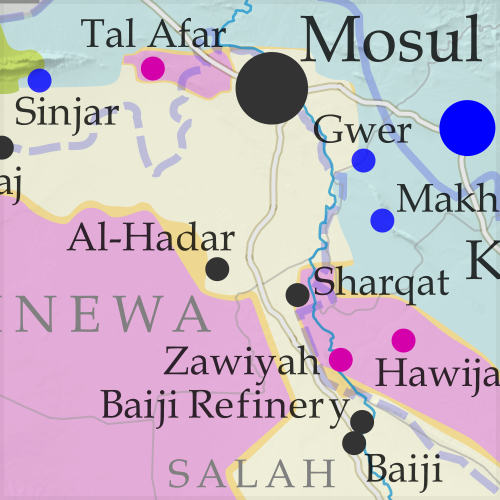 Iraqi government forces have also begun to chip away at the remaining swath of IS territory in the countryside of Anbar province, capturing the town of Anah on the road to the Syrian border. 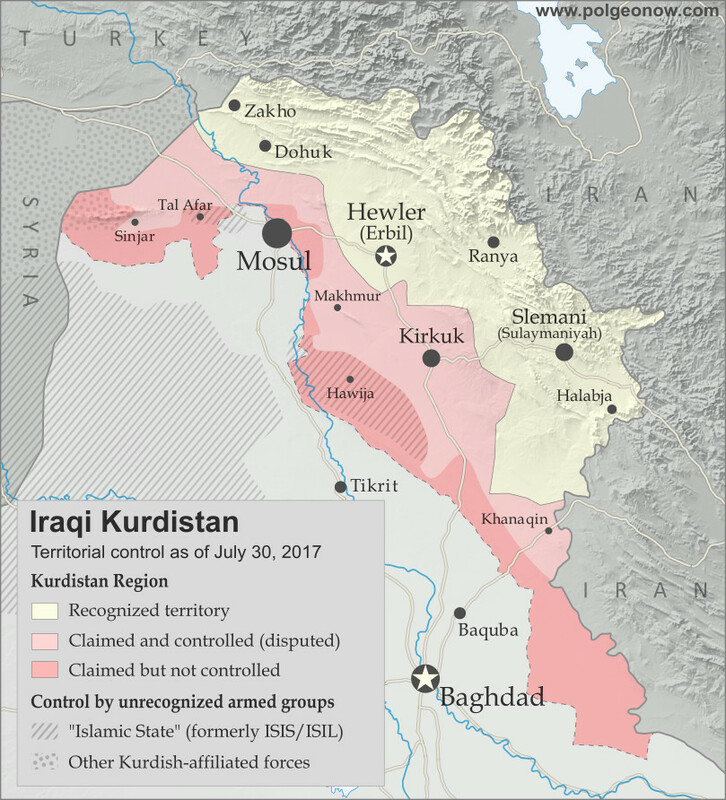 Categories: asia, conflict zones, disputed territories, divided countries, free conflict maps, iraq, isis, kurdistan, middle east, original maps, rebel control, the "islamic state"
Two of the world's autonomous regions are about to vote in controversial independence referendums. Iraqi Kurdistan decides on independence from Iraq this Monday, and on October 1 Catalonia plans to vote on leaving Spain. 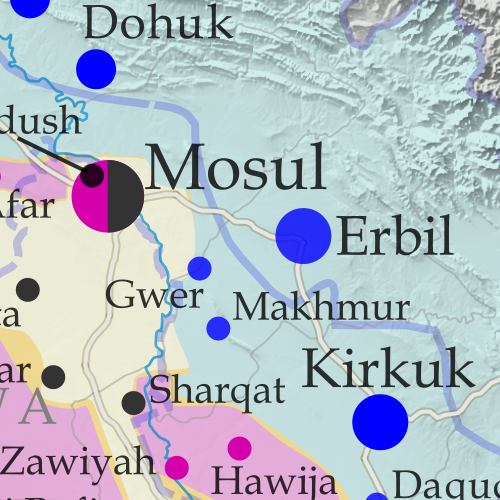 PolGeoNow will be covering these events with a series of articles, but in the meantime we couldn't wait to share our new Iraqi Kurdistan map with you! Graphic by Evan Centanni and Djordje Djukic, incorporating base map by Koen Adams of onestopmap.com. All rights reserved. 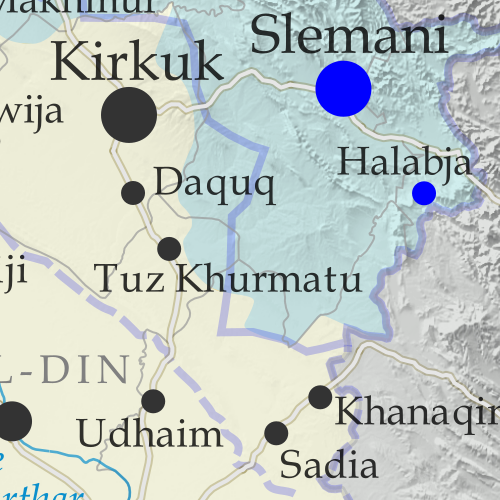 The Kurdistan Region of Iraq (Iraqi Kurdistan for short) is just part of the traditional homeland of the Kurds, the Middle East's fourth-largest ethnic group after Arabs, Persians, and Turks. Many Kurds also live in Turkey, Syria, and Iran. But Iraqi Kurdistan is where they have the most legal rights, governing themselves in what's internationally recognized as an autonomous region within Iraq. But all's not well in Kurdistan-Iraq relations. Iraqi Kurds suffered through horrific violence and persecution in the 1980s and 90s, and now the region's top politician has staked his reputation on separating Kurdistan from Iraq permanently. 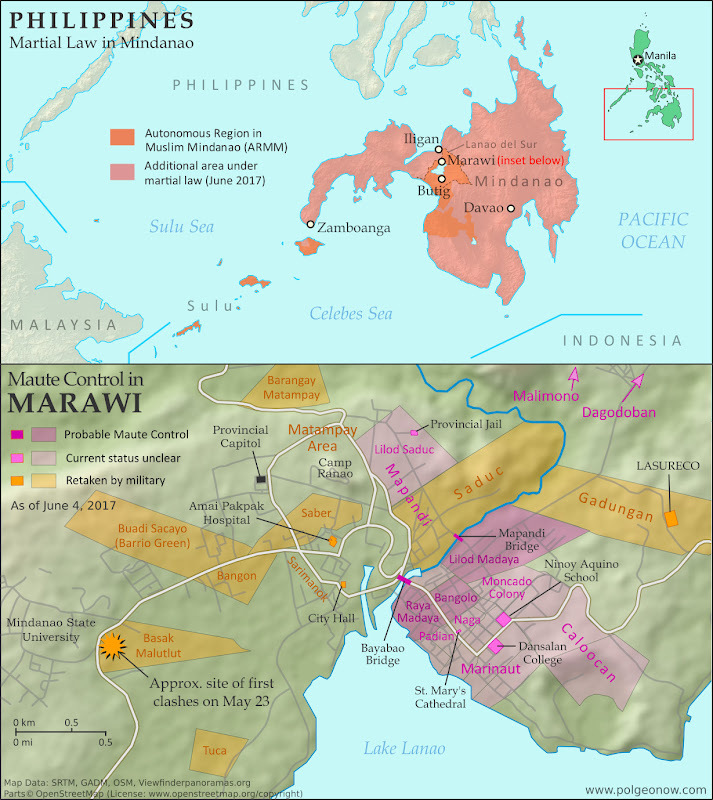 Categories: asia, autonomous regions, breakaway states, disputed territories, elections, iraq, isis, kurdistan, middle east, new countries, original maps, referendum 2017, the "islamic state"
This is the first in our new series of Somalia control maps, which includes regular updates for members of our conflict map subscription service. 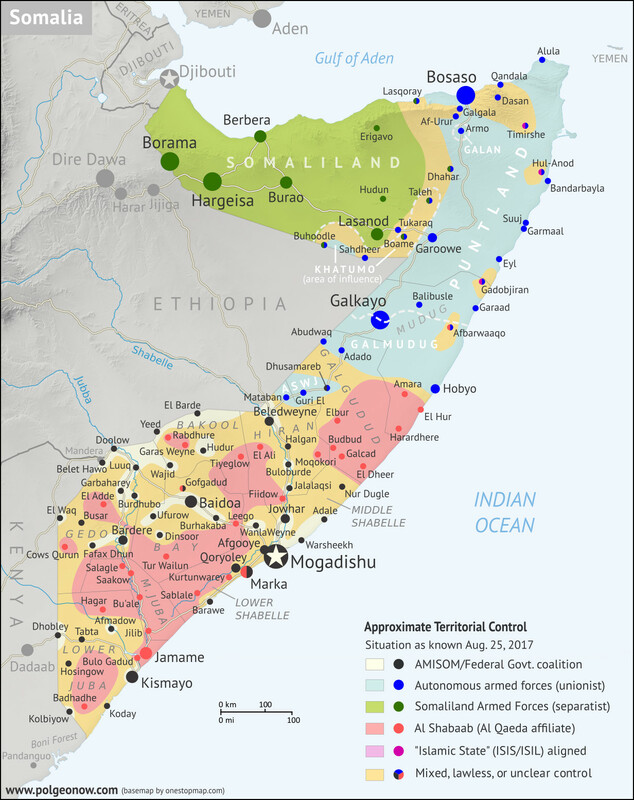 Mapping Somalia: Who Controls What? Of all the world's countries, Somalia is probably the most complex in terms of actual territorial control, and also one of the most constantly-changing. 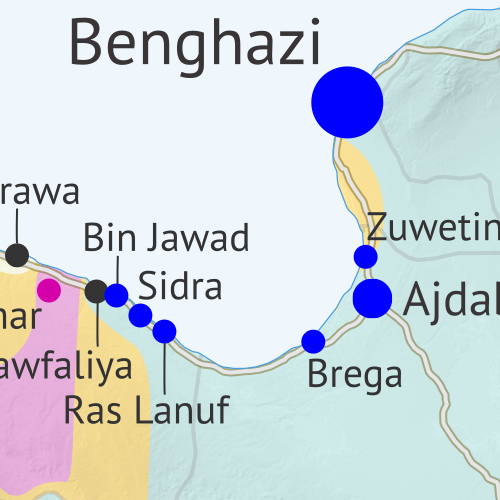 Despite that, good control maps for Somalia are hard to find, with major news outlets using simple, hastily-drawn maps (if any), while crowdsourced mapping projects on sites like Wikipedia suffer from a lack of contributors, infrequent updates, and unclear methods. That's why Political Geography Now set out to create the best-designed, most thoroughly-researched Somalia control map online. 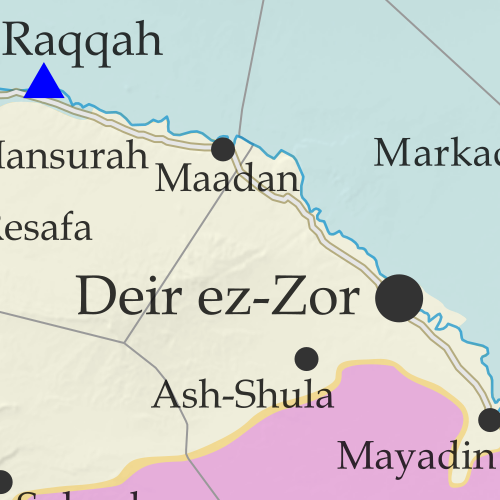 In the past month, the so-called "Islamic State" (ISIS/ISIL) has continued losing ground, with its capital city of Raqqah now completely surrounded by US-backed fighters. 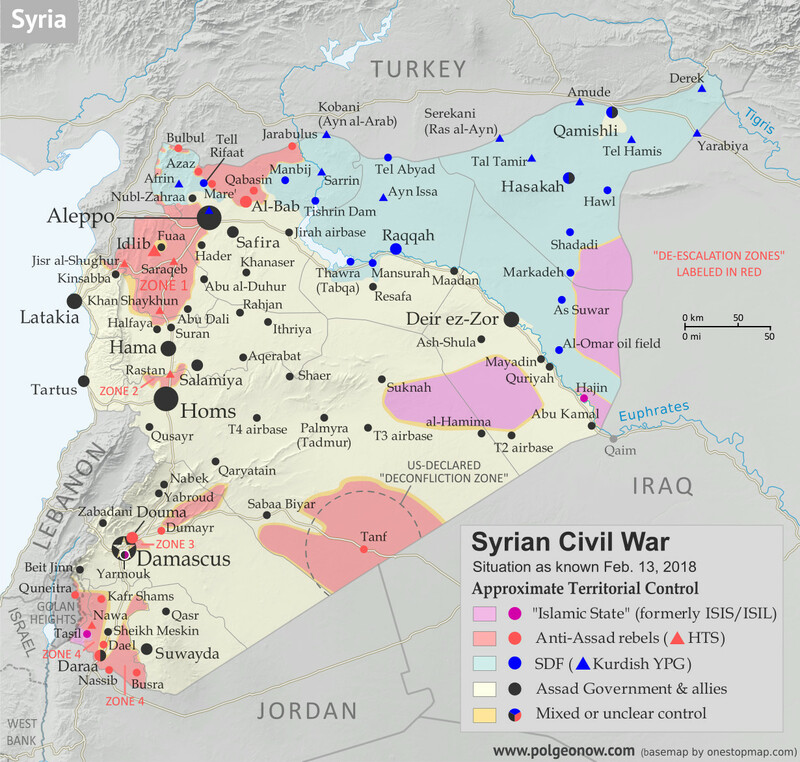 Meanwhile, southern Syria has seen rebel defeats at the hands of government forces, but also a ceasefire backed by both the US and Russia. 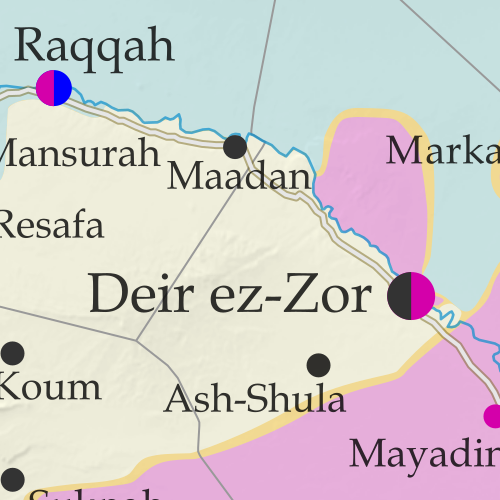 Locations of recent fighting and other important events, including Raqqah, Resafa, Ithriya, al-Hamima, Qasr, and more. 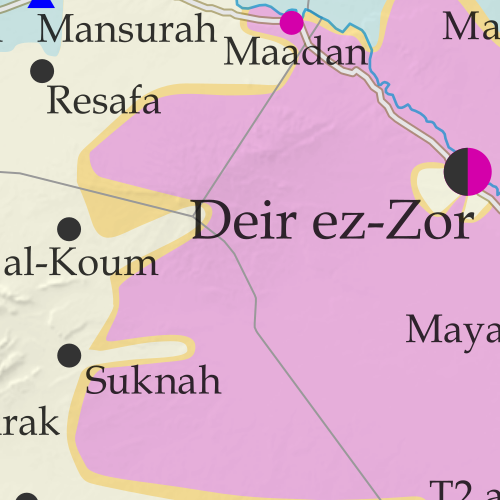 Detailed timeline of important events and changes to territorial control since June 21, 2017, compiled by our Syria-Iraq expert, with links to sources. 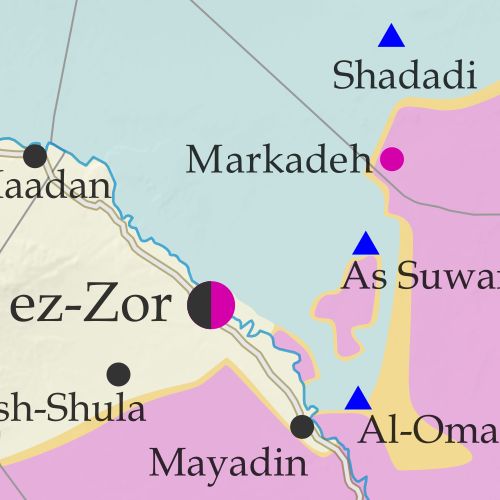 Categories: asia, conflict zones, divided countries, isis, kurdistan, middle east, rebel control, syria, the "islamic state"
In the four weeks since our previous Syrian Civil War map report, the US-backed, Kurdish-led Syrian Democratic Forces (SDF) have advanced all the way into Raqqah, capital city of the so-called "Islamic State" (IS; formerly ISIS/ISIL). 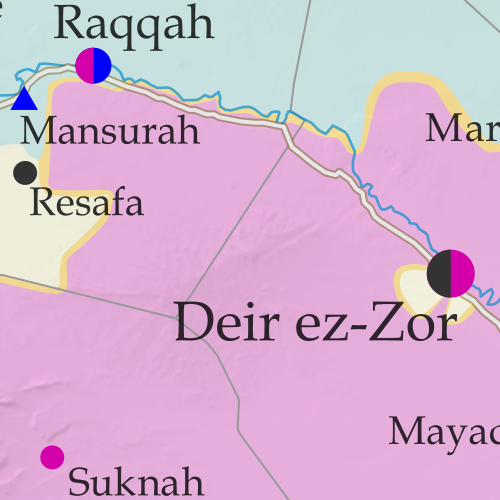 Meanwhile, Syrian government forces have also been pushing hard against IS, nearing Raqqah themselves, while making even more major advances in the southern desert. 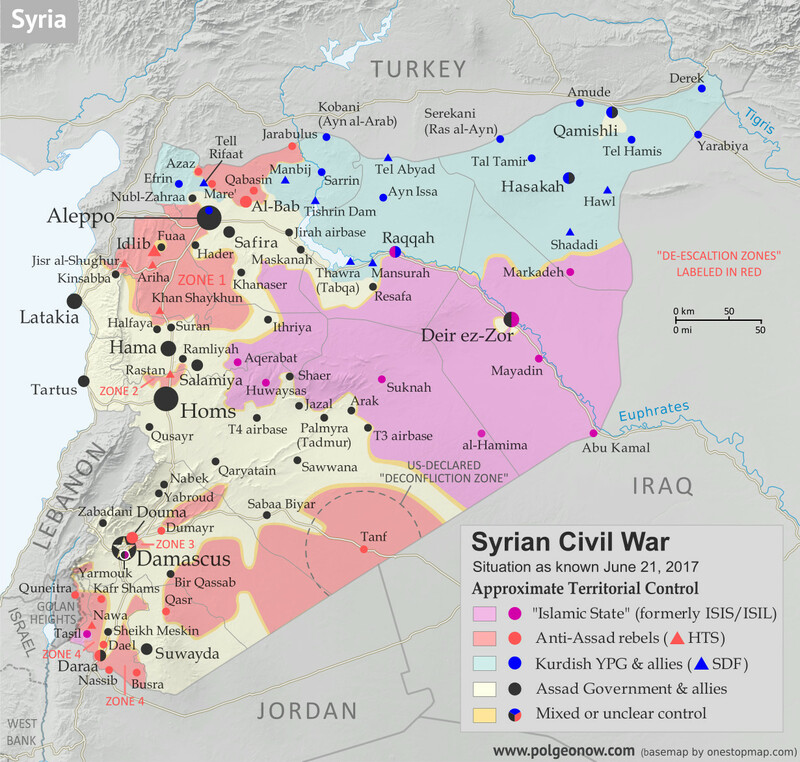 Clashes between rebels and government forces have also continued across Syria's south, even as the US enforces a rebel safe zone around its base in Tanf. 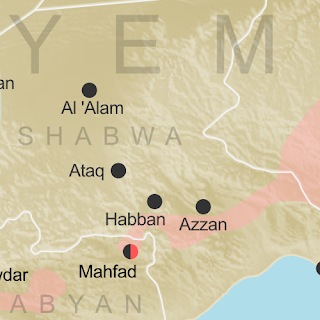 Categories: asia, conflict zones, divided countries, free conflict maps, isis, kurdistan, middle east, original maps, rebel control, syria, the "islamic state"